Reser's Fine Foods of Beaverton, Ore., is recalling 19 refrigerated salad items. The company has been notified by one of its ingredient suppliers that one lot of onions used in the manufacture of the salads may be contaminated with Listeria monocytogenes. The recalled products were distributed to retailers and distribution centers in Alabama, Arkansas, Arizona, California, Colorado, Hawaii, Idaho, Illinois, Indiana, Kansas, Kentucky, Michigan, Minnesota, Missouri, Montana, North Carolina, Nebraska, New Mexico, Nevada, Ohio, Oklahoma, Oregon, Pennsylvania, South Dakota, Tennessee, Texas, Utah, Washington, Wyoming and British Columbia. Customers who purchased these products should not consume them, but discard them or return them to the store for a refund. Consumers with question may contact Reser's consumer hotline at 1-888-257-7913 Monday – Friday from 8am – 9pm (EDT), Saturday 9am – 7pm (EDT), Sunday 11am – 7pm (EDT), or online at www.resers.com. 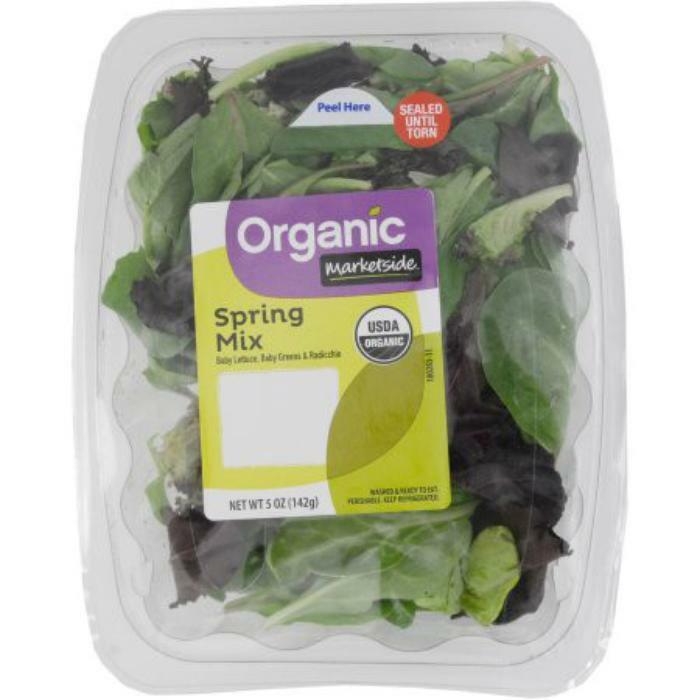 Fresh Express is recalling a limited number of cases of Organic Marketside Spring Mix. Extraneous animal matter -- a decomposing bat -- was allegedly found in a single container of the salad at a Walmart store in the Southeastern U.S. The best-if-used-by date is located on the front label, and the UPC code may be found on the bottom of the container. Consumers who purchased the recalled product should not consume it, but discard it or return it for a full refund to the store where purchased. Consumers with questions may call the Fresh Express consumer response center toll-free at (800) 242-5472 from 8 a.m. -- 7 p.m. (ET). The salads may contain traces of imitation crab meat, which are not declared on the label. The recalled products were shipped to retail and food service distributors in Illinois, Iowa, Kansas, Michigan, Minnesota, Montana, Nebraska, North Dakota, South Dakota, Utah and Wisconsin. Dole Fresh Vegetables is recalling a limited number of cases of Dole American Blend salad in 12 oz. bags, coded A275208A or B, with Use-by date of October 17 and UPC 7143000933, due to a possible health risk from Listeria monocytogenes. No illnesses have been reported in association with the recall. The salads were distributed in 10 states: Illinois, Indiana, Maine, Missouri, New Jersey, New York, Ohio, Pennsylvania, Tennessee and Wisconsin. No other salads are included in the recall. Only the specific Product Codes, UPC codes and October 17, 2012 Use-by date identified above are included. Consumers who have any remaining product with these Product Codes should not consume it, but rather discard it. Retailers and consumers with questions may call the Dole Food Company Consumer Response Center at (800) 356-3111, which is open 8:00 am to 3:00 pm (PT) Monday - Friday. 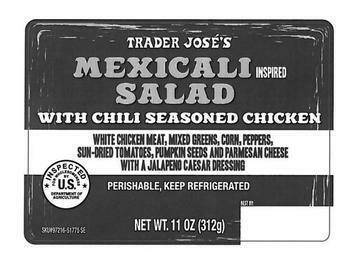 World Class Distribution of Fontana, Calif., is recalling one specific lot of Trader Joe’s Southwest Salad (SKU 56077) with a “Use by Date 11/2/13”, because it may not list soy, a known allergen, in the ingredients. 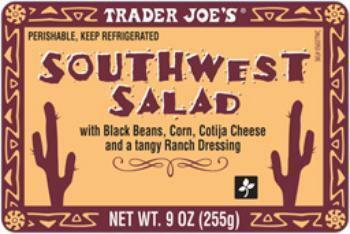 The recall affects only Trader Joe’s Southwest Salads bearing the USE BY Date 11/2/13 packaged in 9-oz. plastic clamshell. The Use by Date is printed on the front label to the right. The 1,861 salads possibly affected were distributed to Trader Joe’s stores located in Arizona, California, Nevada, New Mexico, Utah and Texas. No other lots, products or stores are affected. Customers who have purchased the Southwest Salad may return it to Trader Joe’s for a full refund. Customers with questions may contact the company at 1-909-574-4140, 8 AM – 4:30 PM, PST, Monday-Friday. Ghiringhelli Specialty Foods of Vallejo, Calif., is recalling one specific lot of Trader Giotto’s Caesar Salad (SKU 05161) with a "Use By 11/03" date. The salad may not list allergens -- wheat, soy and fish (anchovy) -- among the ingredients on the label. No illnesses have been reported to date. The recall affects only Trader Giotto’s Caesar Salad bearing the "USE BY 11/03" date packaged in 8.5 oz. plastic clamshell. The Use By date is located immediately above the front label. The 709 salads possibly affected were distributed to Trader Joe’s stores located in Northern California, Reno and Carson City, Nevada. No other lots, products or stores are affected. Customers who have purchased the recalled Caesar Salad may return it to Trader Joe’s for a full refund. Consumers with questions may contact Ghiringhelli Specialty Foods at (707) 561-7670, 8 AM – 4:30 PM, PST, Monday-Friday. Jayone Foods of Paramount, Calif., is recalling all date codes of Trader Joe’s Dried Seaweed Salad with Spicy Dressing (SKU 97677). The product may contain traces of peanuts, an allergen not listed on the label. 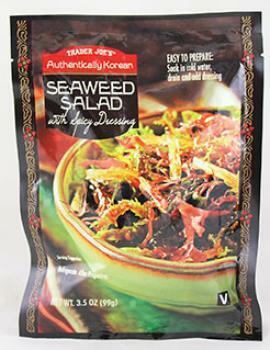 The dried seaweed salad, packaged in a 3.5 oz. foil pouch and found in the grocery aisle at Trader Joe's, was sold nationwide. Customers who have purchased the product and are sensitive to peanuts should to return it to Trader Joe’s for a full refund or dispose of it. Customers with questions may contact Jayone Food, Inc., 8:00a.m.-5:00p.m. PST, Monday-Friday at (562) 232-2754. Athertone Foods of Richmond, Calif., is recalling “Best Buy” dates 9-23-13 through 11-14-13 of ready to eat salads and wraps because they may be contaminated with E. coli O157:H7. The “Best Buy” dates can be located on the front of the package label. Consumers who purchased the contaminated products are urged to return them to the place of purchase for a full refund or dispose of it. Consumers with questions may contact Atherstone Foods at (510) 236-8905 Mon-Fri 9am-5pm PST. Fresh Express of Salinas, Calif., is recalling a limited number of cases of 10-oz. and 6-oz. Italian Salad with the already expired Use-by Date of March 26 and a Product Code of H071A11A. The salad may be contaminated with Listeria monocytogenes. No illnesses have been reported in association with the recall and no other Fresh Express products are affected. 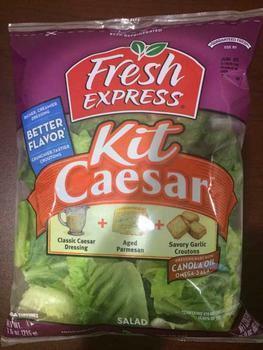 The following recalled salad was distributed in limited quantities to predominantly Eastern and Mid-Atlantic states. Consumers who have the recalled product should not eat it but rather discard it. Consumers with questions may call Fresh Express at (800) 242-5472 during the hours of 8 a.m. to 7 p.m. EDT. Whole Foods Market’s Northern California region is recalling ready-to-eat Artichoke Wheatberry Salad and Southwest SooFoo Salad in response to a recall issued by Glass Onion Catering. The salads have the potential to be contaminated with E. coli O157:h7. To date, 26 illnesses have been reported; however, none of the illnesses are linked to products specifically sold at Whole Foods Market. Customers may have purchased the products from the fresh deli case, salad bar and/or in pre-packed pint or half-pint containers in the Prepared Foods department. Both products have been pulled from all venues and carry an expiration date between Nov. 9 and Nov. 13. Customers who have purchased these products should discard them, and may bring in a receipt to any of the above stores for a full refund. Consumers with questions about the recall may call 512-477-5566, ext. 20060, Monday-Friday from 8 a.m. to 5 p.m. CST. 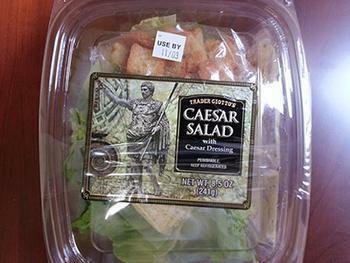 H Group of Framingham, Mass., is recalling 509 units of Trader Giotto's Caesar Salad with Caesar Dressing (SKU 05161). The product contains wheat, soy, egg and anchovy, allergens not listed on the label. These individual salads, sold in the refrigeration section, are marked with the following date codes: "Sell By 04/6/14, 04/7/14 and 04/8/14." The product is packaged in an 8.5-oz. clear plastic clamshell container, with the “Sell By” date printed on the front of the package in the left hand corner. 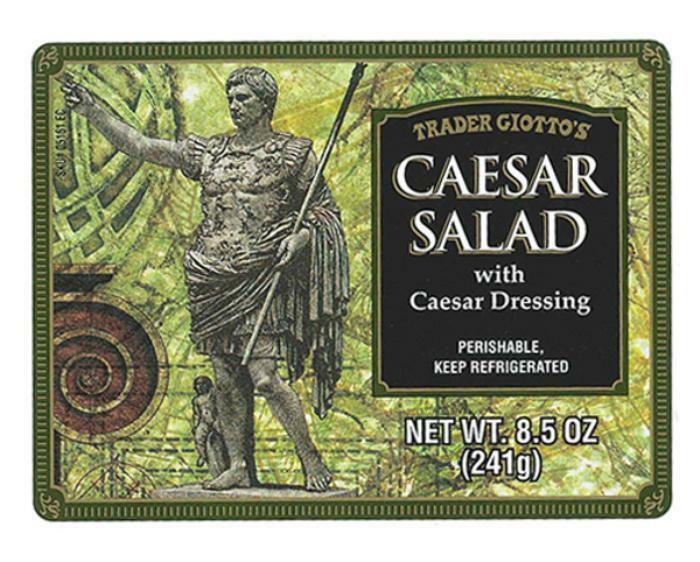 The recalled product was distributed only to Trader Joe's stores in Delaware, Maryland, New Jersey, New York, Northern Virginia, Pennsylvania and Washington D.C.
Customers who have purchased Trader Giotto's Caesar Salad with Caesar Dressing may return it to Trader Joe's for a full refund or dispose of it. Customers with questions may contact H Group, Inc. at (508) 361-1518 from 8:00A.M.-4:00P.M. EST, Monday-Friday. 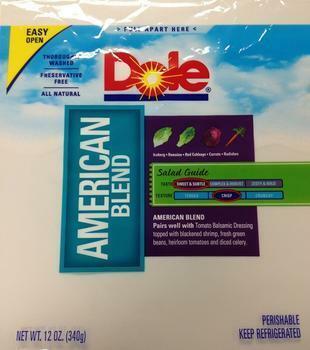 Dole Fresh Vegetables is recalling a limited number of cases of bagged salads due to a possible health risk from Listeria monocytogenes. 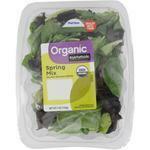 The recalled salads are coded A058201A or B, with Use-by date of March 12, 2014. The product code and Use-by date are in the upper right-hand corner of the package. The UPC code is on the back of the package, below the barcode. The salads were distributed in 15 states (Connecticut, Florida, Illinois, Indiana, Kentucky, Maryland, Massachusetts, Michigan, New Jersey, New York, North Carolina, Ohio, Pennsylvania, South Carolina, Virginia) and 3 Canadian provinces (New Brunswick, Ontario & Quebec). Consumers who have the recalled product should not consume it, but rather discard it. Consumers with questions may call the Dole Food Company Consumer Response Center at (800) 356-3111, from 8:00 am to 3:00 pm (PT) Monday - Friday. Taylor Farms of Swedesboro, N.J., is recalling approximately 377 pounds of Signature Cafe Broccoli Kale Salad with Chicken. The product contains walnuts, a tree nut, which is a known allergen and not declared on the product label. The walnuts are packaged in a cupped packet inside the salad container. 9.75-oz. plastic clam shell packages of “Signature Cafe Broccoli Kale Salad with Chicken” with Use by dates of “10/23/14,” “10/25/14,” and “10/27/14” on the lid of the product. The recalled product bears “P-34513” inside the USDA mark of inspection on the label. The salads, which were produced on 10/17/14, 10/19/14 and 10/21/14, were sent to retail stores in Delaware, the District of Columbia, Maryland, New Jersey, Pennsylvania and Virginia. Consumers with questions about the recall may contact Jim Bryan, director of operations, at 856-294-4211. The product may be contaminated by walnuts, a known allergen, which fell from a tree into spinach bins being delivered from a field. 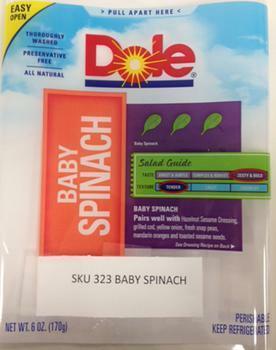 The recall is for Arizona, Nevada and New Mexico, for Dole Baby Spinach 6-oz bags and Dole Spinach 8-oz bags with the specific Bag Codes and Best-by dates listed above. The bag code and best-by date are on the top right-hand corner of the front of the bag. Consumers may call the Dole consumer center toll-free at 1-800-356-3111 from 8am to 3 pm PT, Monday through Friday, for a refund. 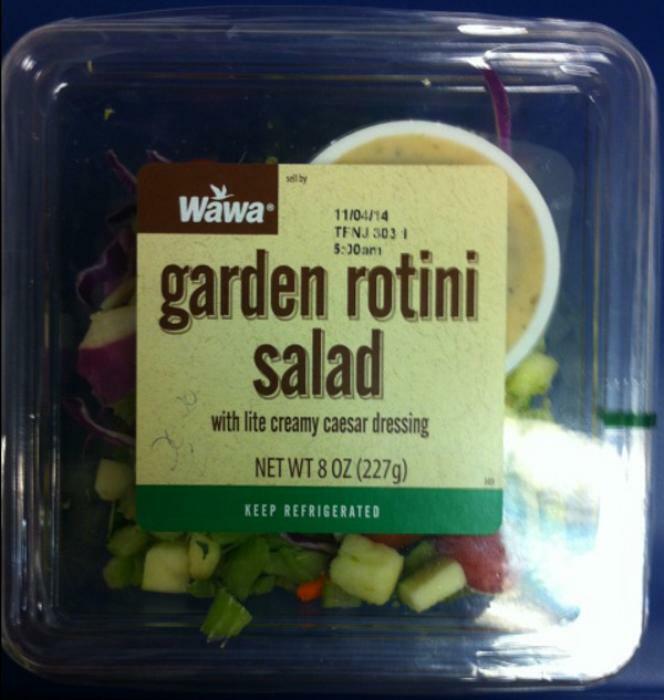 Taylor Farms New Jersey of Swedesboro, N.J., is recalling 1,510 units of Wawa garden rotini salad. The product may contain fish, wheat and egg, allergens not listed on the label. There have been no reported adverse reactions to this product. The recalled product, which was sold to Wawa stores in New Jersey, Pennsylvania, Delaware, Virginia and Maryland, has the code date of “sell by” 11/04/2014 TFNJ 303 1 5:00am found on the top the container. Consumers who have purchased the recalled product should discard it and contact the Wawa call center at 1-800-444-9292 24 hours a day 7 days a week for a full refund. Consumers with questions may contact Taylor Farms New Jersey at 856-294-4181 Monday through Friday between 8am and 4pm EST. 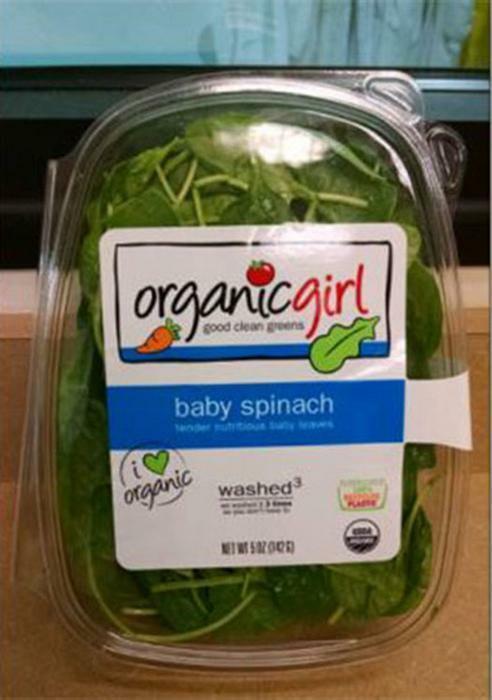 organicgirl Produce is recalling a limited quantity of organicgirl baby spinach. Test results indicate the presence of trace levels of the naturally-occurring element cadmium. Because it is naturally-occurring in the earth's soil, trace levels of cadmium are found in many foods as well as in the water and air. There is no minimum health tolerance for cadmium in crops or soil in the U.S. at this time and the probability of acute health consequences from consumption of cadmium is remote. No illnesses are reported in association with this recall. The recall consists of 1,290 cases of five-ounce packages with a Use-by Date of September 13 and Product Code B030298-001B08S. The product was distributed in13 states: Arizona, California, Hawaii, Indiana, Kansas, Louisiana, Michigan, Missouri, New York, Oklahoma, Oregon, Texas and Utah. Consumers should check their refrigerators for the recalled product, which should be discarded. Consumers with questions may call the organicgirl consumer hotline at 866-486-4939, Monday - Friday, 8 a.m. - 5 p.m. (PST). 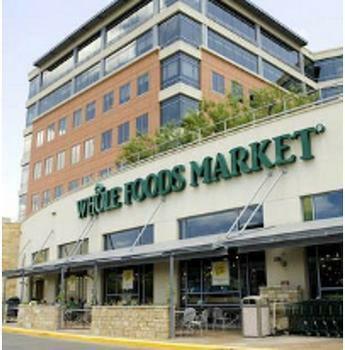 Whole Foods Market is recalling 10-oz. packages of Asparagus, Pea and Ricotta salad. 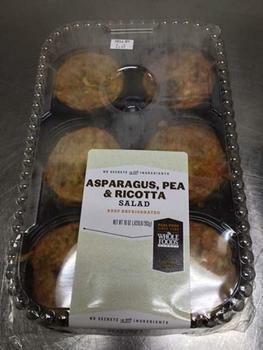 The product was mislabeled and actually contains miniature Asparagus, Sun Dried Tomato and Swiss Frittatas. Due to the labeling error, an egg allergen is not listed on the label. No illnesses or reactions have been reported. Consumers with questions should contact their local store or call 617-492-5500 between 9am and 5pm (EST). 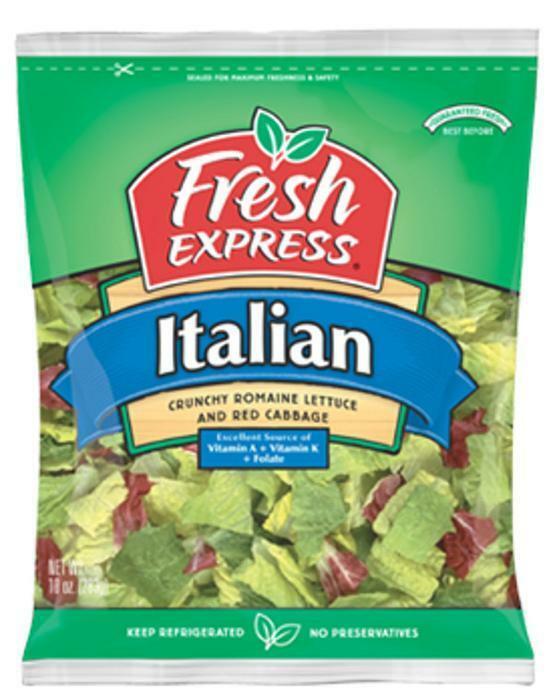 Fresh Express and Giant Eagle are recalling three cases (containing six (6) salads each) of 6.25-oz. 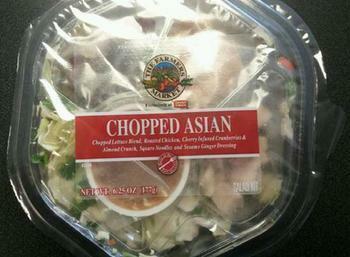 The Farmers Market Chopped Asian Salad Kit . The product contains soy, almonds and wheat, allergens not listed on the label. Giant Eagle has already retrieved all but three individual salad kit bowls and prevented them from being sold. Customers who purchased the recalled product should discard it, or return it to the place of purchase for a refund. Consumers with questions may contact Fresh Express toll-free at (800) 242-5472 from 8 a.m. – 7 p.m. (E) Time or Giant Eagle at (800) 553-2324 from 9 a.m. – 9 p.m. (ET) Monday through Friday. The recalled product was distributed to approximately 19 states primarily in the Southeast. Customers who purchased the recalled product should discard it. A refund is available at the place of purchase or by contacting the Fresh Express consumer response center toll-free at (800) 242-5472 from 8 a.m. to 7 p.m. (ET). GHSE, LLC, of Green Cove Springs, Fla., is recalling approximately 5,682 pounds of salad product containing chicken. The product contains wheat, an allergen not listed on the label. 11-oz. plastic clam shell containers with “TRADER JOSE’S MEXICALI INSPIRED SALAD WITH CHILI SEASONED CHICKEN” with “BEST BY” dates 05/18/16 – 07/03/16. The recalled product bears establishment number “EST. P-45781” inside the USDA mark of inspection, and was shipped to retail locations in Alabama, Florida, Georgia, North Carolina, South Carolina, Tennessee, and southern Virginia. Consumers with questions about the recall may call GHSE at (888) 449-9386. Fresh Express is recalling of 480 cases of 11-oz. 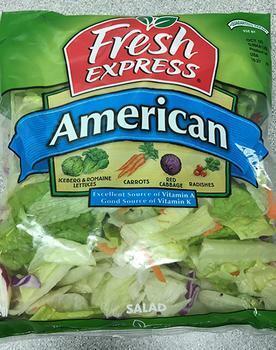 Fresh Express American Salad with a Product Code of G264A12A and Use-By Date of October 5. The product may contain egg, milk, wheat and anchovy, allergens not declared on the label. A refund is available at the place of purchase or by contacting Fresh Express toll-free at (800) 242-5472 from 8 a.m. – 7 p.m. (ET). 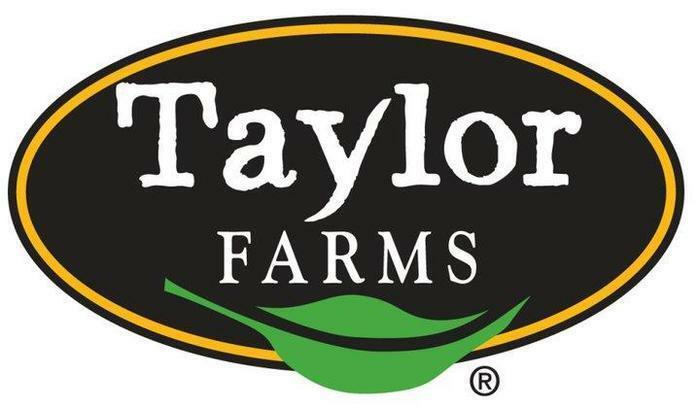 Two Taylor Farms locations in Dallas, Texas and Tracy, California are recalling approximately 6,630 pounds of chicken and pork salad products due to possible contamination by Listeria monocytogenes. This organism can be potentially fatal to young children, the elderly, or consumers with frail or compromised immune systems. Even health consumers can be negatively affected by symptoms such as high fever, severe headache, stiffness, nausea, abdominal pain, and diarhhea. Pregnant women face great risk as well, as the contamination can cause a miscarriage or stillbirth. 10.5 oz plastic trays of "H-E-B Shake Rattle & Bowl ROwdy Ranch Hand (contains pork)" with "USE BY" dates of 2/17/17, 2/18/17, and 2/19/17. Each product was marked with the establisment number M/P-34013 or M/P-34733 inside the USDA mark of inspection. The contamination was discovered on Feb. 10, 2017 by Sargento Foods Inc., which supplies Taylor Farms establisments with cheese products. The U.S. Department of Agriculture's Food Safety and Inspection Service (FSIS) believes that consumers may still have the affected products in their refrigerators. Consumers who are in possession of these products are urged by the agency not to consume them. Instead, the products should be thrown away or returned to the place of purchase. Consumers with questions about the M/P-34013 recall can contact National Accounts Manager Vince Ramos at (510) 378-3132. For more information about the M/P-34733 recall, contact Mark Clement at (214) 565-4848. ChloroFields of Lawrence, Kan., is recalling 20 cases of Asian Microgreens that may be contaminated with Salmonella. The recalled product comes in a 1.5-oz. clamshell, and is identified as Asian Mix Microgreens with a sell by date of 3/26/2017 located on a white sticker on the bottom of the container. The UPC number of the product is 853763007096. It was distributed throughout Colorado, Kansas and Missouri, and through retail grocery stores. 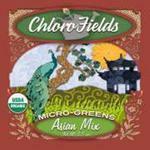 Consumers with questions may call ChloroFields at 785-304-3226 Monday through Friday 8AM-5PM (CDT). BrightFarms is recalling various packaged produce products. Green Cuisine of San Fernando, Calif., is recalling approximately 65,621 pounds of Trader Joe's chicken and turkey salads. The products may be contaminated with extraneous materials -- specifically hard silica and glass fragments. Prime Deli Corporation of Lewisville, Texas, is recalling approximately 217 pounds of ready-to-eat salad with bacon products. 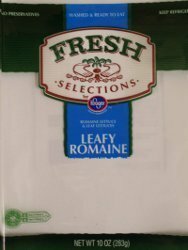 Ready Pac Foods, Inc. of Irwindale, CA is recalling a total of 5,379 cases of bagged salad products containing Romaine lettuce, as listed below, with the Use-by Date of November 18, 2011 because they may be contaminated with E. coli (E.coli O157:H7). E.coli O157:H7 is an organism that may cause diarrheal illness often with bloody stools. Although most healthy adults can recover completely within a week, some people can develop a form of kidney failure called Hemolytic Uremic Syndrome (HUS). HUS is most likely to occur in young children and the elderly. The condition can lead to serious kidney damage and even death. The recall extends only to the listed products with this Use-by Date and sold in the following states: Arizona, California, Colorado, Hawaii, Idaho, Oregon, Texas, and Washington. No other Ready Pac Foods, Inc. products are included in the recall. The voluntary recall was initiated based on a single positive random sample result for E.coli O157:H7 reported to Ready Pac by the FDA. Ready Pac is fully cooperating with the FDA on the recall. Because it is still possible that products bearing the Use-by Date of November 18, 2011 could be on store shelves, this recall extends to retailers as well as consumers. Ready Pac believes that it is important to alert consumers and retailers who might still possess one of the potentially affected salads to dispose of it immediately. Instructions for Consumers: Check your refrigerator for the above listed products with the Use-by Date of November 18, 2011. The Use-by Date can be found in the upper left hand corner of the package with the UPC numbers located on the back side of the bag. Consumers who may have purchased the affected product are asked to record the Use-by Date and UPC number, immediately dispose of the product, and contact the Ready Pac Consumer Affairs representative, toll-free at (800) 800-7822, Monday – Friday, 8 a.m. to 5 p.m. (Pacific Time) to obtain a full refund. Ready Pac Foods, Inc. has earned an outstanding safety record for over 40 years and has taken immediate precautionary measures to protect public health by issuing this voluntary recall and removing product from the market. We have notified all of our retail customers who have received the product in question and directed them to remove it from their shelves. 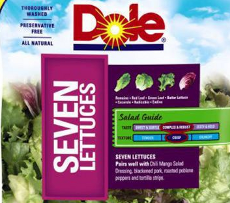 Dole Fresh Vegetables is voluntarily recalling 756 cases of DOLE Seven Lettuces salad with Use-by Date of April 11, 2012, UPC code 71430 01057 and Product Codes 0577N089112A and 0577N089112B, due to a possible health risk from Salmonella. Dole Fresh Vegetables is coordinating closely with regulatory officials. No illnesses have been reported in association with the recall. The Product Code and Use-by Date are in the upper right-hand corner of the package; the UPC code is on the back of the package, below the barcode. 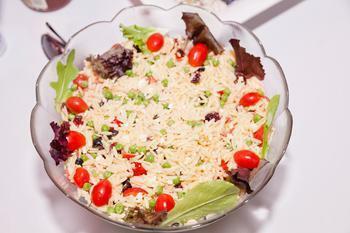 The salads were distributed in fifteen U.S. states (Alabama, Florida, Illinois, Indiana, Maryland, Massachusetts, Michigan, Mississippi, New York, North Carolina, Ohio, Pennsylvania, Tennessee, Virginia, and Wisconsin). No illnesses have been reported in association with the recall. This precautionary recall notification is being issued due to an isolated instance in which a sample of Seven Lettuces salad yielded a positive result for Salmonella in a random sample test collected and conducted by the State of New York. 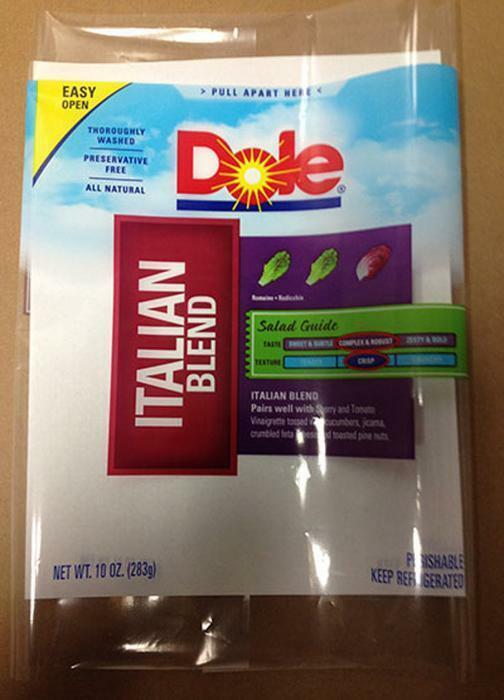 No other Dole salads are included in the recall. 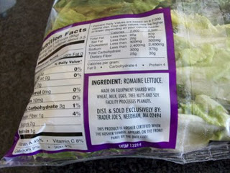 Only the specific Product Codes, UPC codes and April 11, 2012 Use-by-Date of Seven Lettuces salads identified above are included in the recall. Consumers who have any remaining product with these Product Codes should not consume it, but rather discard it. Retailers and consumers with questions may call the Dole Food Company Consumer Response Center at (800) 356-3111, which is open 8:00 am to 3:00 pm (PDT) Monday - Friday. Salmonella is an organism that can cause foodborne illness in a person who eats a food item contaminated with it. Symptoms of infection may experience fever and gastrointestinal symptoms such as nausea, diarrhea, vomiting or abdominal pain. The illness primarily impacts young children, frail and elderly people and those with weakened immune systems. Most healthy adults and children rarely become seriously ill.
Dole Fresh Vegetables is voluntarily recalling 1,077 cases of bagged salads. 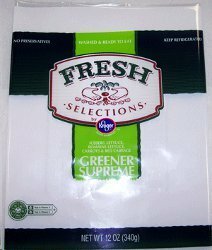 The products being recalled are Kroger Fresh Selections Greener Supreme coded N158 211B 1613 KR04 with Use-by date of June 19 and UPC 11110 91039, Kroger Fresh Selections Leafy Romaine coded N158 111B KR11 with Use-by date of June 19 and UPC 11110 91046 and Wal-Mart Marketside Leafy Romaine coded N158111B with Use-by date of June19 and UPC code 81131 02781. The recalls are prompted by a possible health risk from Listeria monocytogenes, an organism that can cause foodborne illness in a person who eats a food item contaminated with it. Symptoms of infection may include fever, muscle aches and gastrointestinal symptoms such as nausea or diarrhea. 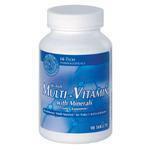 The illness primarily affects pregnant women and adults with weakened immune systems. Most healthy adults and children rarely become seriously ill.
No illnesses have been reported in association with the recall. 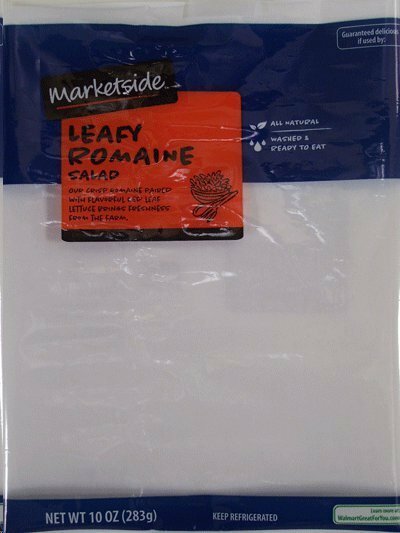 This precautionary recall notification is being issued due to an isolated instance in which a sample of Marketside Leafy Romaine salad yielded a positive result for Listeria monocytogenes in a random sample test conducted by the State of North Carolina. The Product Code and Use-by date are in the upper right-hand corner of the package; the UPC code is on the back of the package, below the barcode. The salads were distributed in six U.S. states (Georgia, Kentucky, North Carolina, South Carolina, Tennessee and Virginia). No other Wal-Mart Marketside, or Kroger Fresh Selections salads are included in the recall. Only the specific Product Codes, UPC codes and June 19, 2012 Use-by date identified above are included in the recall. Consumers who have any remaining product with these Product Codes should not consume it, but rather discard it. Retailers and consumers with questions may call the Dole Food Company Consumer Response Center at (800) 356-3111, which is open 8:00 am to 3:00 pm (PDT) Monday - Friday. Retailers should check their inventories and store shelves to confirm that none of the product is mistakenly present or available for purchase by consumers or in warehouse inventories.